Sometimes I’m taken aback by an unassuming little iPhone game that I’ve never even heard of prior to it starting to download on my device, and doesn’t look like much from screenshots alone, but somehow smacks me right in the face and gets me hooked instantly. This week that game is Drift’n’Drive ($3.99). 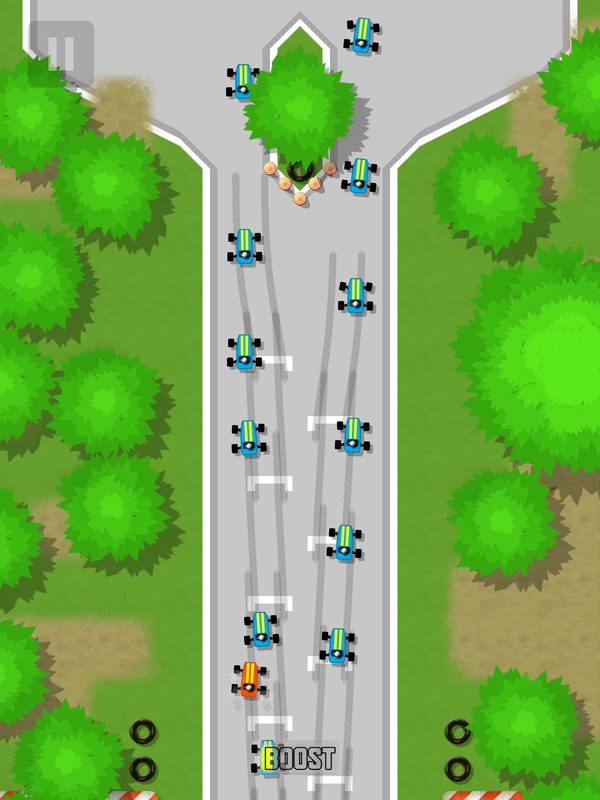 On the surface it looks like another retro-inspired top-down racer, like thousands of others on the App Store. But the thing that sets Drift’n’Drive apart is an advanced physics system that makes racing a total blast, as well as a really interesting career progression that provides lots of tense moments. The physics system in Drift’n’Drive is fast and loose, and feels decidedly more modern than the visuals and presentation would have you believe. It reminds me a lot of the Reckless Racing series. In fact, I described this game on our podcast this week as Reckless Racing meets Super Sprint meets Spy Hunter. It’s a fantastic combination. I also love how as the Career mode progresses there are more and more AI opponents to race against. Towards the end it becomes a massive mess of vehicles, adding to the fun and mayhem. Speaking of that Career mode, the way you earn medals in it is very cool. There’s the standard come in 1st/2nd/3rd for gold/silver/bronze, but if you win a race three times in a row you can actually win a Platinum medal. Going one step further, if you win seven times in a row, you can earn the top medal, which the game calls the Raritarium medal. Having to win so many consecutive races in a row can be stressful, in a good way, because the closer you get the more scary it becomes to blow it on one little mistake. Since races happen so quickly, it never feels tedious to have to win so many in a row or retry many times over in search of that Raritarium medal. Also, as you move on in the Career mode, the number of consecutive wins you need for that medal increase. It’s tense stuff, folks. There’s all sorts of other little touches that make Drift’n’Drive such an exceptional little game. The randomized nature of the tracks. 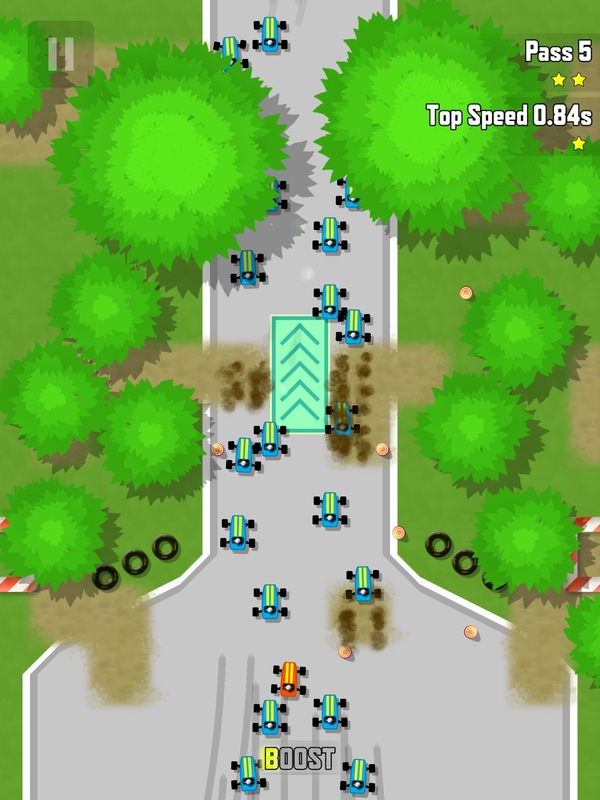 The fact that hazards like cones and tires that line the tracks each have their own physics built in, so they provide a more dynamic challenge. And to top it all off, I haven’t even touched on the excellent upgrading system that features new parts for your vehicle that have both positive and negative effects, forcing you to make strategic choices on how to upgrade rather than simply buying the next thing in line. It’s all very awesome, so if you happened to see Drift’n’Drive launch earlier this week and didn’t think much of it based off of its basic, retro visuals, be sure to give it a second look as it quickly became my favorite iPhone game of the moment.